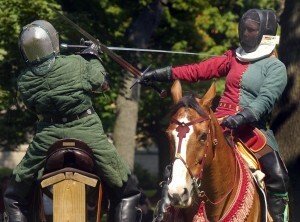 One of the centerpieces of the Forteza curriculum is historical European swordplay. There are a number of traditions of swordsmanship, which can be divided by period: early modern, Baroque, Renaissance or Medieval; and by nationality: English, French, German, Italian or Spanish. As the home of the Chicago Swordplay Guild (and as the Italian name of our studio might suggest), we focus on Italian swordsmanship of the 14th – 17th centuries. By the late Middle Ages, the Italian peninsula had become an ever-changing patchwork of petty kingdoms and free cities. Wars to gain, hold, and influence other cities put the peninsula in a state of nearly continuous, small-scale warfare, as political goals were carried out by force of arms. Dominating the field were the condottieri, mercenary knights who fought the despots’ wars, and had to be versed in a multitude of weapons including the sword, spear, and axe, in or out of armour, on foot or horseback, and against any number of opponents. In the process, they developed a martial art of a richness and complexity to stand beside any other in the world. Half a millennium later, the doorway to that martial art stands open to you. Our medieval martial arts curriculum comes from the 14th century Italian master-at-arms, Fiore dei Liberi, son of a minor nobleman from Friuli in northeastern Italy, who has been called “the father of Italian martial arts”. A wandering swordsman, soldier and fencing master, after fifty years or study he composed a series of detailed, illustrated manuscripts, all entitled il Fior di Battaglia (the Flower of Battle). Maestro Fiore gave no formal name to his school or his martial art, simply calling it Armizare (are-mee-TZAR-ay), which means “the art of arms”. He divided Armizare into three principle sections: close quarter combat, long weapon combat and mounted combat. Within these subsections, dei Liberi taught his art through a series of zoghi (“plays”) —formal, two-man drills akin to the kata of classical Japanese martial arts. 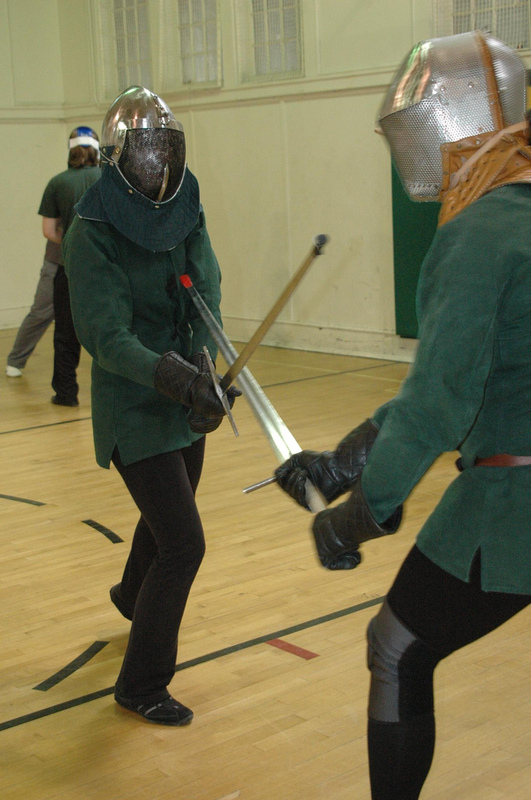 Scrimia (literally “fencing”, ie: “swordplay”) begins with the sword, but forms the technical, mechanical and tactical basis for fighting with all other long weapons in Armizare, such as the spear and poleaxe. The system also includes the use of several unusual weapons, such as monstrous, specialized swords for judicial combat, a slashing, winged-spear called a ghiavarina, and hollow-headed polehammers, filled with an acidic powder to blind the opponent! Opportune Striking – Use strikes to points of pain to eliminate advantages of size and strength. Breaking structure – Use strikes and holds to break your opponent’s connection to the earth. Taking space – Occupy your opponent’s space to eliminate their options. 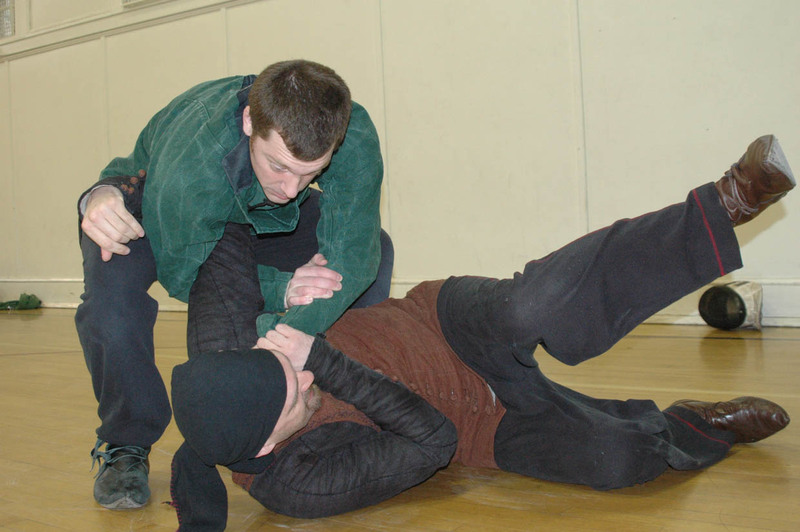 These strategies are applied through a diverse range of techniques, including throws, holds, joint locks, breaks, binds, and disarms, all of which are applied both unarmed and when wielding or confronted by the dagger. The medieval dagger was a large weapon, often the length of a man’s forearm, and designed for both self-defense, and as the call of last resort on the battlefield, where its sharp point could puncture the weak-points in armour. Dagger fighting and unarmed combat are closely intertwined in Armizare, and together form the basis of fighting with all other weapons, especially in armour. The ethical system of chivalry, in theory vs. practice, and its evolution over time. IS THE ARMIZARE PROGRAM RIGHT FOR ME? Are interested in working with a diverse array of weapons. Want a martial practice that has the depth and diversity to keep you engaged for a life time.